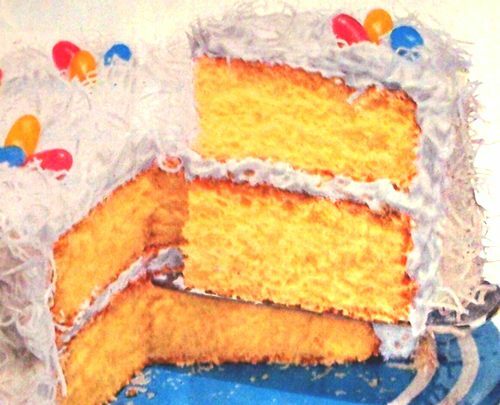 Thanks to Grandma's old fashioned Easter cake recipes, you can make delicious holiday cakes that will delight your family and guests. We all know that homemade cakes taste much better than the store-bought variety, and these fancy dessert cakes offer absolute proof. 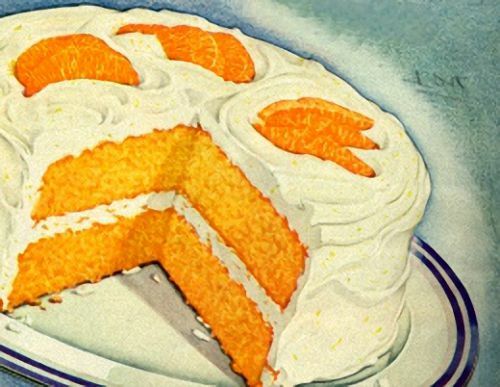 Whether it's the orange layer cake with its whipped orange flavored frosting, the versatile white cake decorated with coconut, the pound cake adorned with freshly cut flowers, or the yummy flower garden cake, you'll love serving them to company. They all have that delicious old fashioned taste. As shown in the illustration above. 2-1/2 cups sifted cake flour, 2 teaspoons baking powder, 1/4 teaspoon salt, grated rind of 1 lemon, grated rind of 1 orange, 2/3 cup butter or shortening, 1-1/2 cups sugar, 3 eggs unbeaten, 2 tablespoons lemon juice, 5 tablespoons orange juice, 2 tablespoons water. Sift flour once, measure, add baking powder and salt, and sift together three times. Add lemon and orange rind to butter, and cream thoroughly; add sugar gradually, and cream together until light and fluffy. Add eggs, one at a time, beating thoroughly after each addition. Add flour alternately with combined fruit juices and water, a small amount at a time. Beat after each addition until smooth. Bake in two greased 9-inch layer pans in moderate oven (375°F) 20 minutes, or until done. Spread Whipped Orange Frosting (see icing recipe below) between layers and on top and sides of layer cake. Decorate with either orange or tangerine pieces. Juice and rind of 1 orange, 2 tablespoons flour, 1/2 cup sugar, 2 egg yolks or 1 whole egg, 1 cup whipping cream. Mix all ingredients together except cream, and cook over boiling water until thick. Allow to get cold. Whip cream stiff and carefully fold orange mixture into whipped cream. 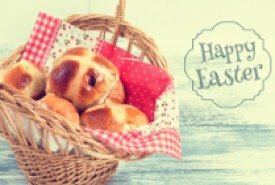 For this Easter cake recipe, combine sifted flour, baking powder, salt, and sugar in flour sifter. Stir shortening to soften in mixing bowl, sift in dry ingredients, add 3/4 cup of the milk, and the vanilla. Mix until all flour is dampened. Then beat 2 minutes with electric beater or 300 strokes by hand. Add eggs and remaining milk and beat 1 minute longer. (Beat vigorously by hand or at low speed of an electric beater. Count only actual beating time.) Scrape bowl often while beating to thoroughly mix ingredients. Pour cake batter into two round 9-inch layer pans lined on their bottoms with paper. Bake in moderate oven (375°F) for 25 minutes, or until done. Cool in pans 5 minutes, then loosen and turn out on racks, remove paper, and turn layers right-side up to cool before frosting (see frosting recipe below). Combine egg whites, sugar, salt, water, and light corn syrup. Beat until thoroughly mixed. Cook over rapidly boiling water, beating with electric beater 7 minutes, or to stiff peaks. Remove from heat, add vanilla, and beat 1 minute longer. Spread frosting between layers and over sides and top of dessert cake. Then sprinkle with shredded coconut. Decorate with colorful jellybeans for the Easter dessert table. For this colorful Easter cake recipe, tear an angel food cake into pieces in large bowl. Beat egg yolks in top of double-boiler; combine 3/4 cup sugar and gelatine and stir into egg yolks; add lemon juice, orange juice, and lemon rind. Cook over hot water stirring constantly until custard mixture coats silver spoon. Cool. Beat egg whites until frothy, then beat 3/4 cup sugar in gradually, beating well after each addition, then continuing to beat until stiff and glossy. Then fold whites into cooled custard mixture along with crushed pineapple and chopped maraschino cherries. Finally, pour custard mixture over angel food cake pieces. 1/2 cup butter, 1-1/3 cups sugar, 1 cup milk, 3 cups pastry flour, few grains of salt, 3 teaspoons baking powder, 1-1/4 teaspoons vanilla, 4 egg whites. For this Easter cake recipe, cream the butter, add sugar and cream until light and fluffy. Sift flour, salt, and baking powder three times and add alternately with the milk to which the vanilla has been added. Beat egg whites stiff and fold them in gently. Bake about three-quarters of an hour in a moderate oven till done. Coconut White Cake: Add 1 cup shredded coconut to the above white cake recipe, either white or toasted, and top with a wreath of freshly whipped cream. Nut White Cake: Add 1 cup of coarsely chopped nut meats -- any kind except peanuts. Fruit White Cake: Add 3/4 cup of halved raisins and 1/4 cup chopped citron peel, stirring the fruit into the flour after it has been sifted. You can use this quick and easy frosting with any Easter cake recipe. 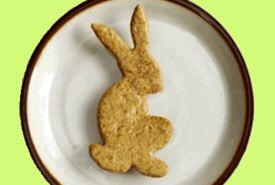 3 tablespoons butter, 3 tablespoons milk, 2 cups sifted icing sugar, 1 teaspoon vanilla. Cream butter until light and fluffy; add sifted icing sugar and milk alternately, beating well until the icing is light and of a nice consistency to spread. Add vanilla. 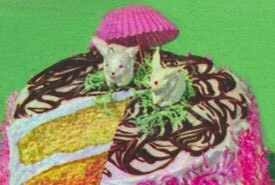 This unique Victorian Easter cake recipe is taken from the book "Buckeye Cookery and Practical Housekeeping" published by Buckeye Publishing Company, Minneapolis, in 1877. Make sure the flowers have been carefully washed and are free from any pesticides. One pound sugar, one of butter, one of flour, ten eggs; bake in a dripping pan one inch in thickness; cut when cold into pieces three and a half inches long by two wide, and frost top and sides; form on the cake stand in pyramid before the icing is quite dry by laying, first in a circle, five pieces with some space between them; over the spaces between these lay five other pieces, gradually drawing in the column and crowning the top with a small bouquet of freshly cut flowers. Mix 4-1/2 ounces butter with an equal amount of sugar, add 5 eggs well beaten, 1 cup of milk, 2 ounces yeast, and 10 ounces flour. Let it rise for 2 hours, form into shape of a large fleur-de-lis, or 3-pointed flower to represent the Trinity, ice with sugar, and bake 1 hour in oven. Tcheureks such as these are sold at the Easter season, during Passion and Holy Weeks.